I’m working with artgroup 15 Hundred Lives, at the Creative Bubble Shop in Swansea for 3 days. We’re doing our second ‘What Do Artists Do All Day‘ event. 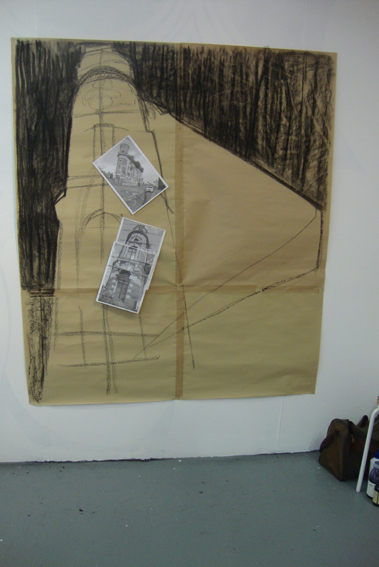 I’m doing another big drawing installation. The aim of these events is for the public to be able to see how artists work; how we create an artwork from the start. Most people only ever see a work of art in a gallery or hanging on someone’s wall, all completed and framed. Often they’ll have no idea how it’s made, so we’re working in the shop / gallery for three days so people can come in and see how it’s done. At this stage I’m drawing onto brown wrapping paper; several sheets stuck together with paper gumstrip and stapled to the wall. I’m using compressed charcoal and chalk. The image is an interpretation of a local landmark, The Palace Theatre. It’s really tiring because I’m on my feet all day. My Nana used to say ‘Ooh! My dogs are barking!’ when her feet were tired and aching. I don’t know why. More to come tomorrow.